Catalogues, price lists and other advertising matter are only an indication of the type of goods offered and except as expressly provided in these terms and conditions no prices or other particulars contained in them shall be binding on Guest Supplies Ireland. a) Where the buyer undertakes to collect the goods Guest Supplies Ireland shall not in any circumstances be liable for any damage from whatever cause which arises while the goods are in transit. The buyer shall advise Guest Supplies Ireland in writing for any non-delivery of any part of any Purchase Order within two working days of the date of delivery. Consignments of 12 units or less to be documented on returned copy of delivery note and notified in writing to Guest Supplies Ireland immediately. For consignments of 13-50 units Guest Supplies Ireland shall be notified in writing within 24 hours of delivery. For consignments comprising more than 50 units Guest Supplies Ireland shall be notified in writing within 48 hours of delivery. Goods delivered in a damaged condition must be signed for as such and retained for Guest Supplies Ireland inspection. Where Guest Supplies Ireland is satisfied that damage occurred prior to delivery to the buyer Guest Supplies Ireland may in its absolute discretion and in satisfaction of it’s entire liability to the buyer repair or replace free of charge any part of the goods so damaged. 3) The seller is not the manufacturer of the goods. The goods are sold with all warranties (if any) issued by the manufacturers and based upon the fact that the manufacturers only manufacture goods of merchantable quality, the goods are transmitted without examination by the seller upon the basis that any lack of merchantable quality is a matter between the buyer and the manufacturer. Prices are at all times subject to fluctuation and, irrespective of any quoted prices in any literature of the seller, goods will be invoiced at prices applicable for the goods ordered at the date of dispatch. Goods are sold and supplied on the condition that they may be sold, offered or used upon the terms of the business arrangements and conditions of licence imposed by the manufacturers, copies of which are obtainable on request. 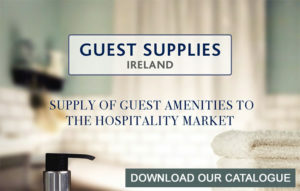 All payments are due within 30 days of the date of invoice unless an authorised representative of Guest Supplies Ireland agrees different payment terms in writing with the buyer. Payment shall be deemed not to have been made until any and all cheques, drafts and bills by which payment is to be effected have been cleared or honoured (as the case may be). a) The property in and title of the goods shall not pass to the buyer until the buyer has paid the price in full. b) So long as the property in and title to the goods remains in the seller, the seller will be entitled to re-take possession of the goods at any time (whether or not such goods have been fixed to or incorporated in any other goods) and for that purpose to enter upon any premises of the buyer. c) Notwithstanding that the title to and property in the goods has not passed to the buyer, the buyer shall be entitled to sell the goods or any part thereof, but such sale shall be deemed to be for the account of the seller and any proceeds thereof shall be held by the buyer on behalf of the seller until the buyer has paid the price in full. 8) Until such time as the property and goods shall have passed from the seller in accordance with condition 7 above, the buyer remains liable to the seller for any loss or damage to the said goods however caused and it shall be the duty of the buyer to insure the said goods at their full market value. We offer a full 30-day Money Back Guarantee if you are not completely satisfied with the goods supplied. If you wish to return an item please call our customer support team on 083 817 9167 who will be happy to assist you with your return. The customer support team will issue you a Returns Note Number that is valid for 30 days and supply you a returns postage label or offer details of when our carrier will collect your package. Please ensure your Returns Note Number is quoted in all correspondence when supplied and is clearly visible on any return packaging if not supported by our returns postage label. When returning goods please ensure they are unused and in the original packaging, any item received damaged or marked when received back to us will not be accepted for a refund. On issuing a refund we will refund using a method of our choice, this will normally be via the card used for payment but in some circumstances may also include a bank transfer payment or cheque, at our discretion. We are sorry but any special order item (key fobs etc.) cannot be returned. We offer a full refund or exchange on any faulty items.